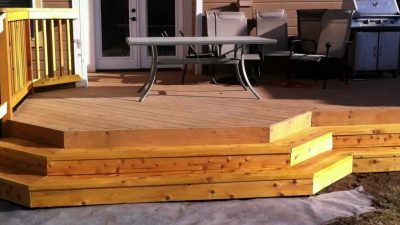 Deck stairway should be planned very carefully, so that all the rises and all the runs should be equal. If the bottom or top step is noticeably different in height or length from the other stairs, it will be a tripping hazard. Also, the stairs must be done with codes, which are designed to keep people safe. Using prebuilt stairs will usually not meet code. – The stair’s treads should be at least 36 inches wide. We think stairs should be at least 48 inches wide, so they don’t feel cramped. – The maximum allowable unit rise is 7 3/4 inches, and the minimum unit rise is 4 inches. For recommendations on rise-run combos, see the tip. – The difference between a stair’s longest and shortest riser height or stair depth should be no more than 3/8 inch. This is pretty strict, so take the time to plan your stringers carefully. – An open stringer should have notches that are not too deep, or the stringer will be weak. See the illustration [place tk] for the required minimum dimensions of the uncut portion of the stringer. – The stair’s railing posts (near the bottom of the stairs) should be firmly attached. Anchoring to the side of a stringer may be enough, but many inspectors prefer that the posts also be sunk in concrete footings, for extra rigidity. – The stair railing should include a graspable handrail. – Openings in the railing should be no larger than 4 3/8 inches between balusters, and 6 inches between the bottom rail and the tread, as seen in the illustration. – Stringers should be spaced close enough to adequately support the treads. This spacing depends on the tread materials. If treads are 2-by lumber, stringers can usually be as far apart as 16 inches on center. If 5/4 decking or composite decking is used, they should be 12 inches or closer. Be sure to check with your building department.